These are super simple, super delish, and perfect for a quick lunch or even afternoon snack! Even better?! You won't hear up the kitchen in this heat! #score. But I think that was pretty self-explanatory. 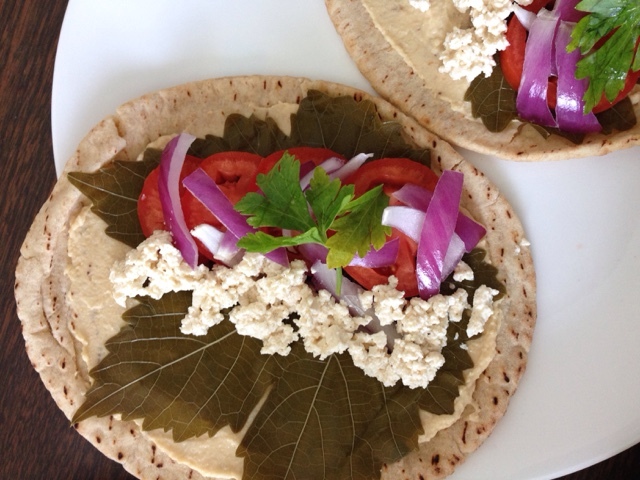 Greek style Pita Sanwiches. Vegan, Gluten-free. Serves one. 1. Lay your pita breads flat and spread each with 2 T of the hummus (divide evenly between the two). 2. 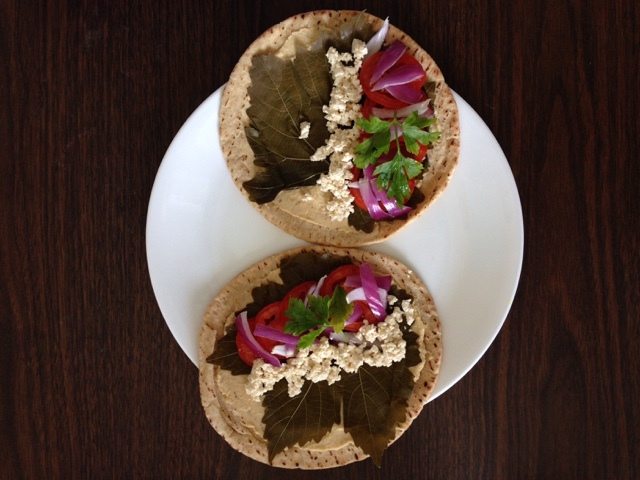 Lay one grape leaf on each hummus-slathered pita. 3. 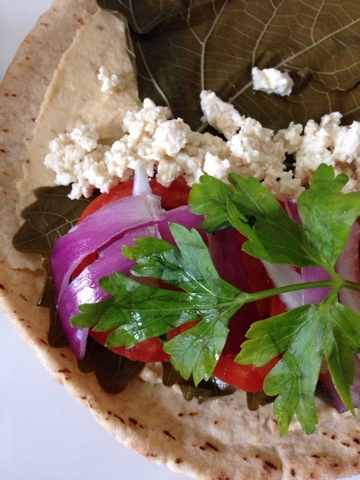 Place Roma slices close to one side of each pita and top with red onion slices. Set aside. 4. For the "tofu feta", place tofu in a small bowl and add vinegar, onion, garlic, and pepper and mash with the back of a fork. 5. Sprinkle tofu feta to the inside of the tomato slices. 6. Top with parley and fold in half before eating. 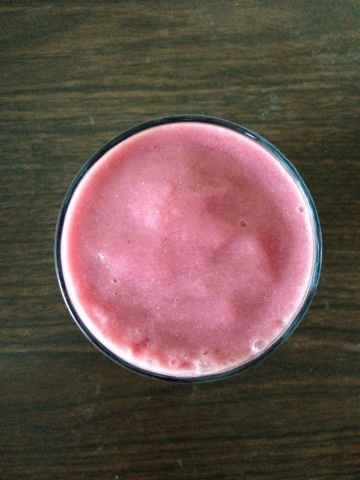 World's Creamiest (Vegan) Strawberry Vanilla Smoothie. Secret Ingredient Revealed! World's Creamiest Strawberry Vanilla Smoothie. World's Creamiest Strawberry Vanilla Smoothie. Vegan, Gluten-free. Serves one. Cauli, vanilla, stevia, and milk. Blend low to high until silky smooth and luscious looking. 2. 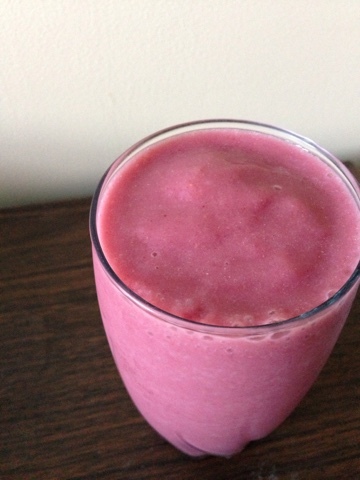 If you can resist drinking this straight from the blender, pour into a tall glass and enjoy! Summer Tomato Dijon Spaghetti with Fresh Mint. Summer is officially here, people. The temps have hit the upper 90s here in Delaware this week, and let me tell you all: I COULD NOT BE HAPPIER! Summer, to me, signifies so many things...family, fun, freedom, happiness, and last but NOT least, fresh, delicious summer produce! The lovely Roma tomato is the star of this show, dressed with a nice tangy Dijon Vinagrette and garnished with fresh mint. This quickie dinner can easily be whipped up in less than 15 minutes, which officially makes it another of my "Dinn in 10" recipes! Enjoy, guys! Summer Tomato and Dijon Spaghetti with Fresh Mint. Sweet tomatoes, tangy Dijon, refreshing spearmint...what could be better?! Summer Tomato Dijon Spaghetti with Fresh Mint. Vegan, Gluten-free. Serves one. 1. One serving spaghetti noodles of choice, cooked according to package instructions and set aside. 1. In a medium size bowl, combine prepared noodles and Roma tomato. 2. In a small bowl, whisk Dijon, stevia, and water. Pour over pasta mixture. hydrating afternoon snack. Get creative, too! If you're not into oranges, try grapefruit or even lemons or limes! Just note that if you do opt for sour citrus fruits for your juice bowl, you will want to sweeten it significantly more than if you follow the recipe. Regardless, enjoy your juice bowl! 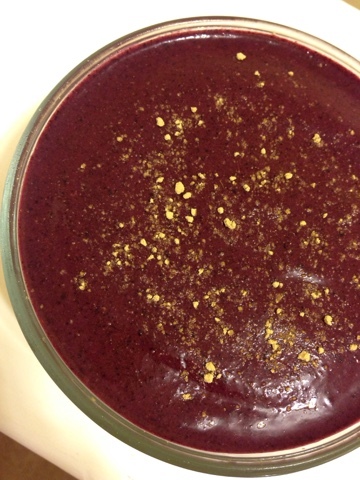 "Smoothie bowls ain't got nothin' on me." --Orange Juice Bowl. Orange Juice Bowl. Vegan, Gluten-free. Serves one. 1. In your vitamix, combine oranges, water, stevia, and protein powder. Blend until smooth. 2. 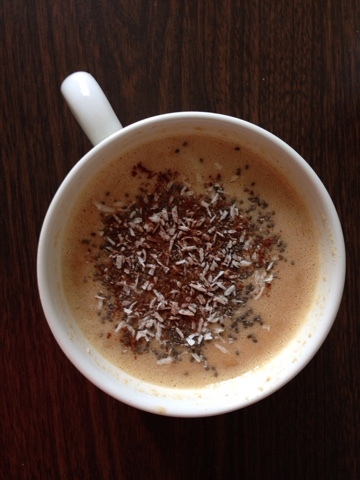 Pour into a bowl and mix in psyllium powders. 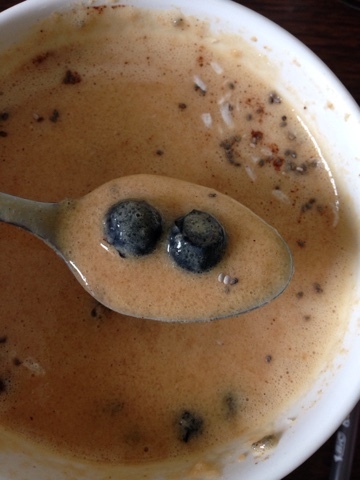 Add blueberries and stir. 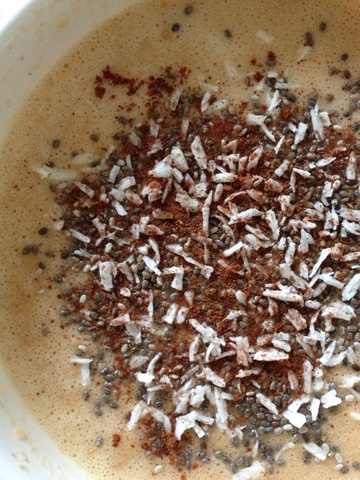 Top with chia, coconut, and optional cinnamon. Enjoy! 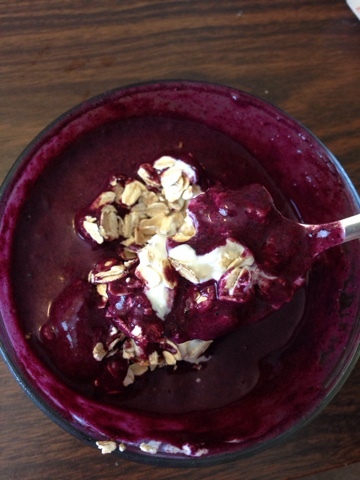 Blueberry and Blood Orange Smoothie Oatmeal Parfait. This one's kind of a mouthful...but this insanely delicious breakfast of mine (enjoyed this morning, as a matter of fact!) DESERVES an epically long title! But long title does NOT mean long prep time; you can whip this bad boy up in about 15 minutes, start to finish. And this can definitely go for a lunch or snack as well as a breakfast...dinner is acceptable, too! Whenever you opt to enjoy it, I know you will! Look at those luscious layers! I'm literally drooling. This was so good! SERIOUSLY. LOOK AT THOSE COLORS. 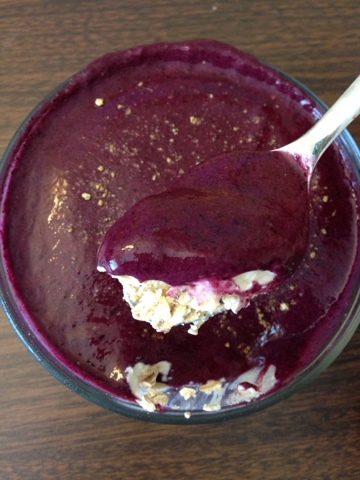 Blueberry and Blood Orange Smoothie Oatmeal Parfait. Vegan, Gluten-free. Serves one. 1. 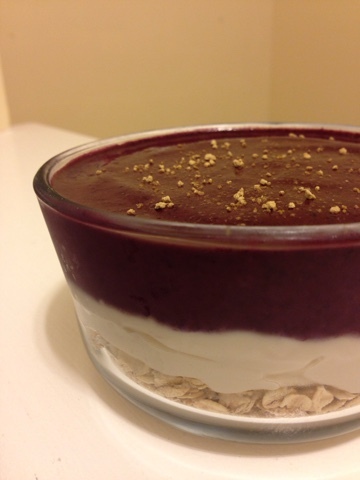 In a small trifle bowl, spread raw oats on bottom. 2. In your food processor, blend tofu, vinegar, and stevia until smooth. Spread evenly over oats. 3. Blend remaining ingredients in your vitamix until smooth and creamy. Spoon over Nogurt and garnish with ginger. 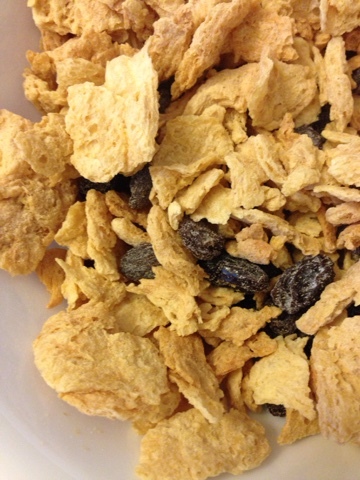 Healthified Raisin Bran Cereal. Vegan, Gluten-free. Serves one. 1. 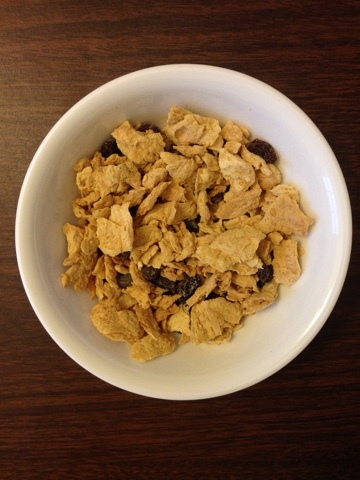 In a medium size bowl, combine tsp, raisins, and stevia. Mix well to coat with stevia. Add milk and serve! So simple and delish. *TSP is different than TVP. For this specific recipe, you want to make sure you use TSP FLAKES, by granules. I use NOW Foods brand (sold on Amazon). 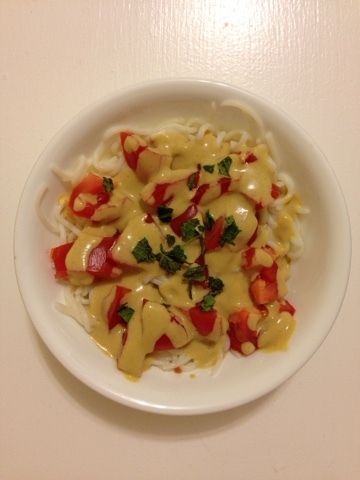 Green Curry Mango Sauce with Tofu and Green Cabbage. Not quite sure where summer has run off to...its 50 degrees and raining here today! Thus, a cooked food recipe is essential to warm up! Enjoy this one--sweet and spicy with hints of tangy and salty. Basically perfect...whatever your craving at the moment! 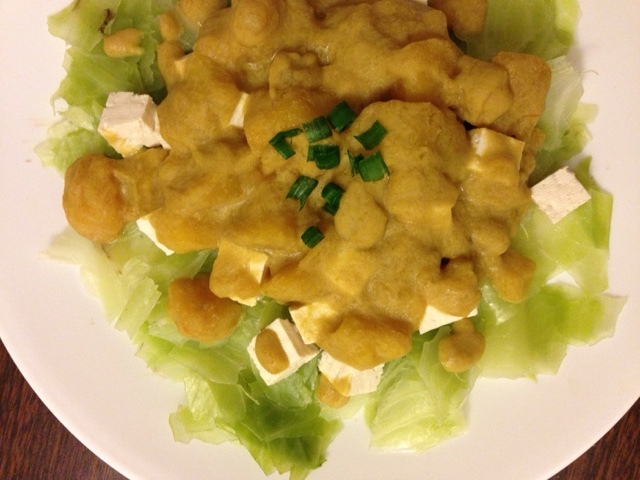 Green Curry Mango Sauce with Tofu and Green Cabbage. Vegan, Gluten-free. Serves one. 1. 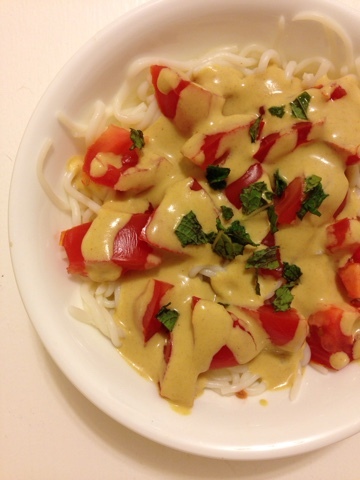 In a small soup pot, combine coconut milk and curry paste and whisk over medium heat until mixed. 2. Add thawed mango and braggs aminos and stir. 3. Bring to a simmer. Simmer 5 minutes, add coconut flour, stir, reduce heat, and continue to simmer for 5-7 minutes. Sauce is done when thickened and carmelized. Serve over tofu and cabbage with Pitas or brown rice.